The Perfect Foxhunter - Sold! Leonardo is truly a one-of-a-kind horse. His dam is a rare and beautiful American Cream Draft and his sire is an even rarer 100% Crabbet Arabian.Â We are thrilled that he has been purchased by Ms. Ruthie, who also owns a sweet Crabbet Arabian gelding she purchased from us 2 years ago.Â At the end of March we will be taking Leo to his loving new home. American Cream Drafts are known for their fine conformation, calm disposition, and ease of handling. Crabbet Arabians are remarkably athletic, intelligent, and sensible. Happily, Leonardo has inherited the best traits of both breeds. 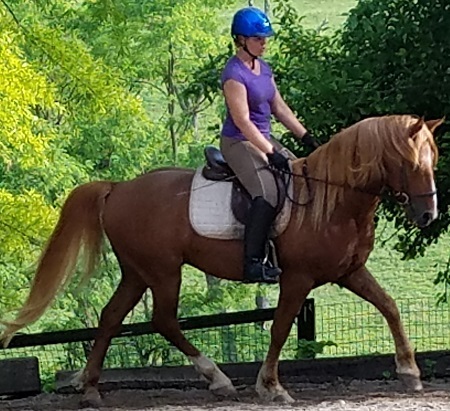 Leo is a solid, powerful gelding with exceptionally smooth gaits. A talented and willing jumper, he is light, responsive, and takes the leg well. Leonardo also has plenty of speed when you ask for it. 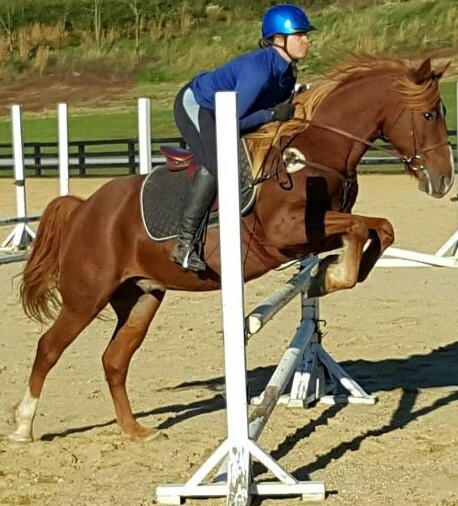 He has frequently travelled to cross-country jump courses, hunter paces, and a fox hunt where he was completely undaunted by the hounds and general hubbub. His exceptional steadiness and athleticism make him a great first- or second-flight hunt prospect. Well trained with Natural Horsemanship techniques, Leo is a kind and affectionate horse, always first in line for human attention at the fence or in the field. He is 15.1 hands and 7 years old. Leonardo has rock solid legs; has always been barefoot; is easy to load; and stands well for mounting, trims, and the vet. Bred and raised here at Harley Farm, he is a registered half Arabian who is up to date with his vaccinations, hoof trims, and floats. Leo is priced at $18,000.